First Thought After Finishing: WOW! I need more now! Even though Six of Crows has been out for a while, I hadn’t gotten around to reading it because I’m about 382,746,988 (yes, that’s an EXACT count) books behind on my TBR pile. I actually started listening to this book on a trip with my family, and may I just say that the audiobook is phenomenal! Needless to say, I was immediately sucked into the story and continued to read furiously once out of the car. 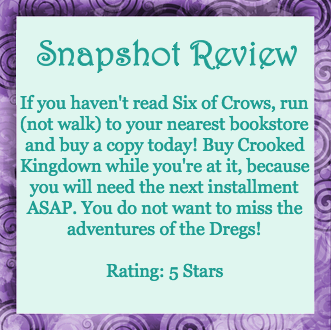 Set in the Grishaverse, Six of Crows tells the story of Kaz “Dirtyhands” Brekker and his exploits in Ketterdam. Known for his shrewd cunning and ruthless deeds, he has become the de facto leader of The Dregs, one of Ketterdam’s rival gangs. After (unknowingly) displaying his skills to a council member, he is approached with an impossible proposition: to rescue one of the most-wanted people from the most secure place in the land. Together with a hand-picked team, Kaz sets out on what might well be a suicide mission, but one that offers riches only dreamed of if he succeeds. If it’s not obvious, I love Kaz. He definitely qualifies for book-boyfriend status. He has a troubled past—because let’s be honest, who doesn’t love a bad boy with a troubled past?—but I don’t love him for the sympathy angle. Kaz is a schemer and a visionary. How could anyone help but fall for his skill with tactical maneuvers and the way he takes the weight of everything onto himself? If that sounds unromantic, it might be because Kaz struggles with emotions himself. Enter Inej, the Wraith. She might technically be second to Kaz, but she earned her reputation with skills that Kaz could never have. Inej is the master of stealth and gathering secrets, which fuel many of Kaz’s plans. I loved Inej’s strength and her devotion to her Suli saints even in the face of everything that said she had no reason to believe in the good anymore. At this point, I hardly think it’s a spoiler to say that everyone knows she and Kaz should be together, but as with all good stories, it could hardly be that easy. The rest of the cast of characters is also wonderful. From Nina, who embraces who she is and is willing to make sacrifices for those she loves, to Mathias, the strong, stoic, somewhat silent type, who shows what you have to risk to pursue what’s right, to Wylan and Jesper, who bring much-needed comedic relief but are no less heroes in their own right. I loved this subsection of the Dregs and would read about any of their adventures any day. Six of Crows might be a fantasy, but it’s also an action-packed thriller. 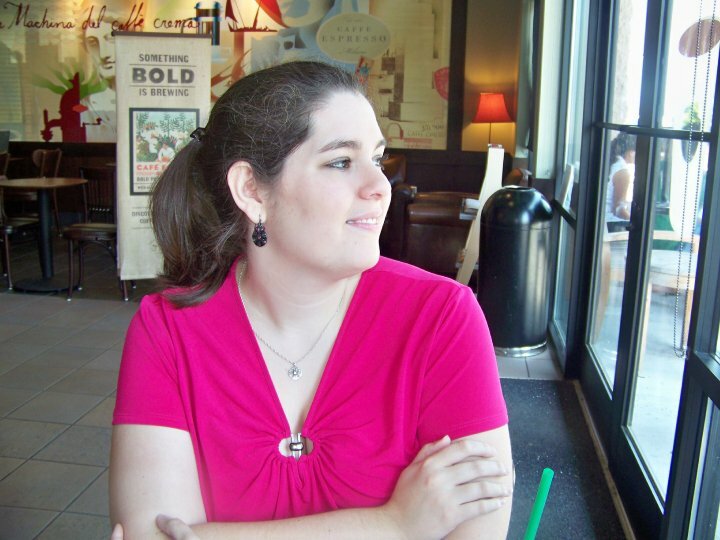 Plot twists came with every turn of the page, but the conversations and development of the characters were woven so thoroughly into the adventure that I never felt like anything was sacrificed. The only thing that bothered me (aside from wanting MORE) was the fact that Kaz was supposed to be 17. I know it’s YA, and I know it’s fantasy, but in this book it bothered me more than normal, because his character just seemed to be so much older. But all of my feelings on that subject will be in their own post soon. With every book she writes in the Grishaverse, Leigh Bardugo proves why she is a storytelling sorceress. “Loved” hardly seems to be a sufficient description for how I felt about this story and these characters. It has earned a place on my favorites shelf, and I’m only delaying reading Crooked Kingdom because I want the magic of the story to last a little longer. 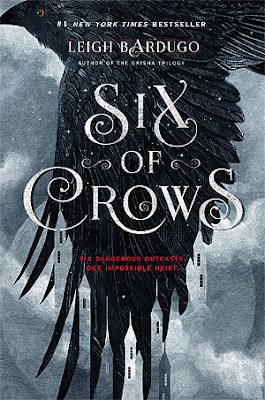 But I have no doubt it will be just as magical as Six of Crows. Most Memorable Aspect: Kaz. Inej. All of the Dregs. Lovely review! Totally agree, Kaz is awesome! I loved all his scheming! This book is such a step up from Shadow and Bone (which I already liked).